stepped comb-lift for maximum safety during emptying; optional emptying by lifting trunnions reinforced with steel inserts. The mobile waste containers with two-part flat lid is made of high quality plastic and noted for its excellent ease of handling. The four 4 wheeled recycling containers is manufactured in accordance with European Standard EN 840 Parts 2, 5 and 6 for mobile waste and garbage bins. 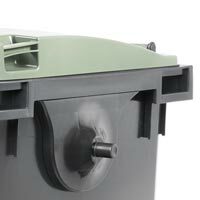 The sturdy two-part flat lid (lid in lid) of the four 4 wheeled commercial waste containers has a slightly rounded shape to prevent rainwater ingress. If required, the two-part lid can be replaced by a single lid. The practical additional smaller lid of the mobile waste containers significantly eases the deposit of waste into the domestic waste bins. If required, the additional smaller lid can be flipped back to approx. 180°. 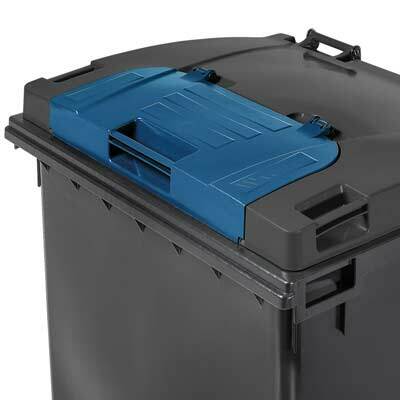 The four 4 wheeled commercial waste containers with fat lid features ergonomically positioned open handles which allow for easy and secure movement of the recycling containers, even when fully loaded. 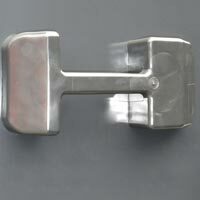 The design of the handles allows users/operators to have a good and secure grip even when wearing gloves. 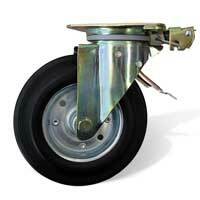 The standard braking system of our four 4 wheeled trade waste containers consists of footbrakes (double-stop). Wheels and swivel rings are blocked when depressing the brake pedals. The wheels of the dustbins can be locked independently of each other. 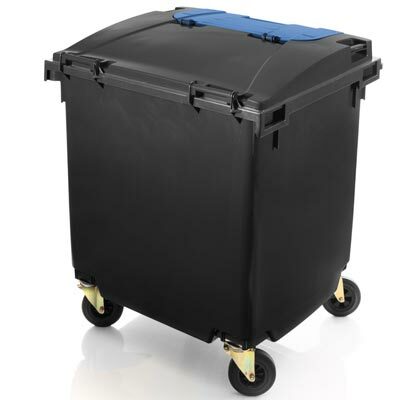 Mobile waste containers 1100 L with lid-in-lid facilitate your waste disposal and are part of our modern product range of 4 wheeled bins! If required, our four 4 wheeled garbage bins/trash cans can be fitted with lifting trunnions (for DIN devices) in accordance with EN 1501-5. The trunnions of the mobile waste containers are reinforced with steel insert. 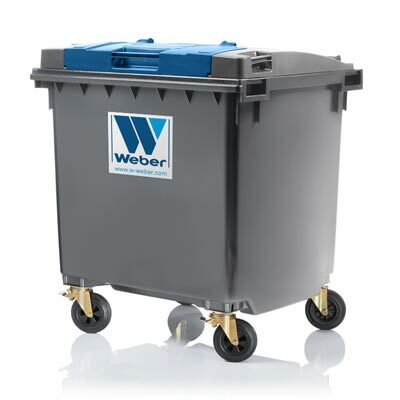 Side handles can be fitted to our mobile waste containers from the producer Weber. 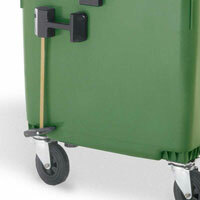 The handles are in accordance with EN 840-2 and assist the manoeuvring and lifting of the mobile garbage bins. They consist of high quality plastic and are supplied as standard if you order the travelling gear with central braking system. Our four 4 wheeled mobile waste containers is also available with a central braking system as an option. 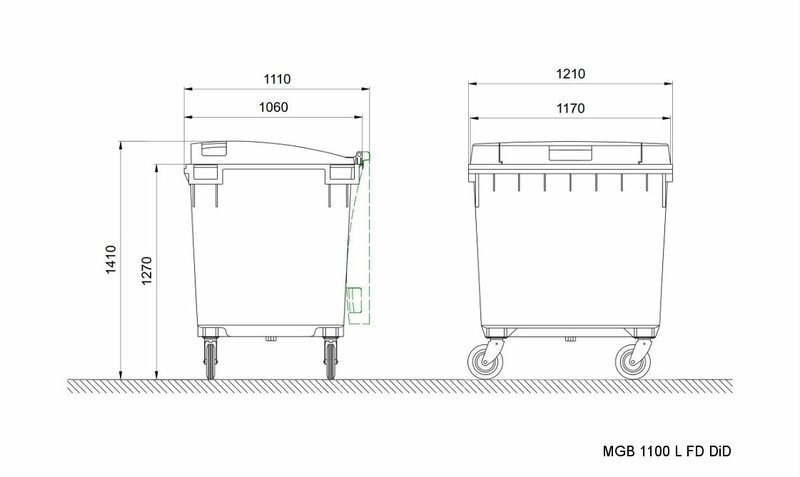 A foot pedal installed at the right side of the refuse bins engages the central braking system. The system is unlocked with a triangular key inserted into the side handle. If your four 4 wheeled waste recycling bins need to travel longer distances or have to carry particularly heavy loads etc., you should equip your domestic waste bins with special heavy-duty wheels. 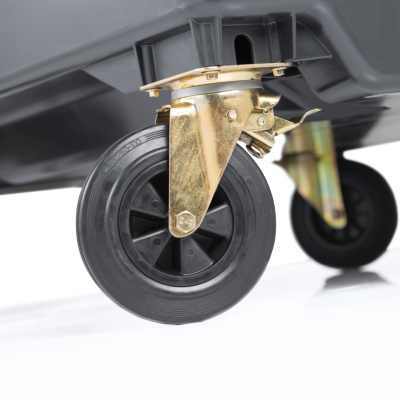 We offer a huge variety of special wheels for various applications, including heavy-duty castors with steel rims and roller-bearings, castors with non-marking or non-chalking surfaces and polyamide wheels. We would be pleased to advise you on the most suitable. If you want to use your four 4 wheeled mobile waste containers, for outdoor use, with a towing kit, it is essential to fit steering locks to two castors of your waste container. 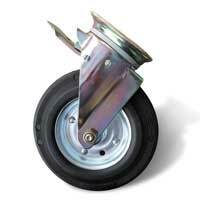 These will keep the castors of the dustbins in line with the direction of the towing vehicle. Customised and permanent marking of our wheeled recycling bins is available at a surcharge. 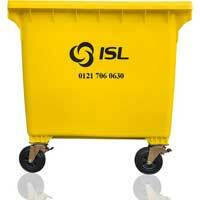 Our mobile waste containers can be hot-foil printed in a single colour on the lid and/or the body.